According to NOAA (https://www.arctic.noaa.gov/Report-Card) Arctic surface air temperatures continued to warm at twice the rate relative to the rest of the globe, leading to a loss of 95 percent of its oldest ice over the past three decades. Arctic air temperatures for the past five years (2014-18) have exceeded all previous records since 1900 and are driving broad changes in the environmental system both within the Arctic as well as through the weakening of the jet stream which separates the Arctic from warmer climate zones. 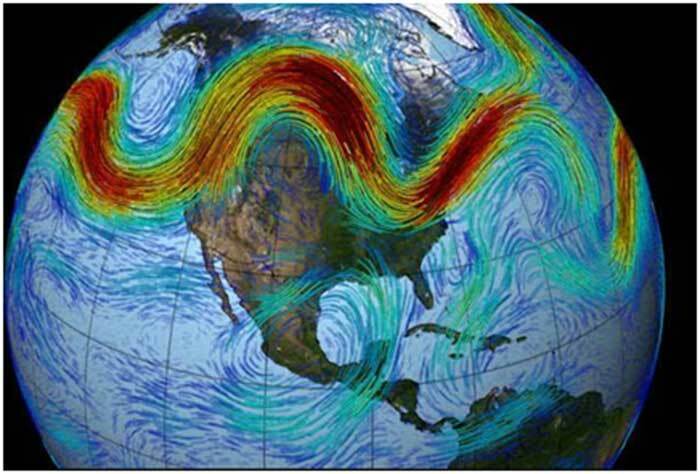 The recent freezing storms in North America represent penetration of cold air masses through a weakening and increasingly undulating jet stream barrier (Figure 1). This weakening also allows warm air masses to move northward, further warming the Arctic and driving further ice melting. 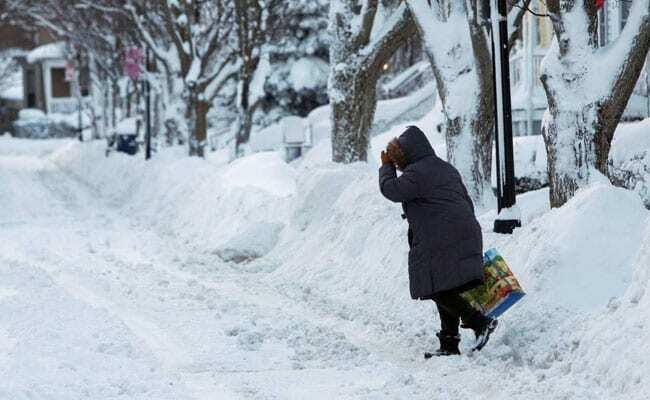 The freezing storms in North America arecheering climate denialists(http://www.climatedepot.com/?mc_cid=01532523d4&mc_eid=effe2faeed)who refuse to discriminate between the climate and the weather. The paleo-climate record indicates that over the last 800,000 years peak interglacial temperatures were consistently succeeded by temporary freeze events, attributed to the flow of cold ice melt water flow into the North Atlantic Ocean. As the Earth continues to heat and cold air masses move southward from the Arctic, temperature contrasts increase, leading to arise in the intensity and frequency of extreme weather events. The paleoclimate evidence raises questions regarding the mostly linear to curved future climate trajectories proposed by the IPCC for the 21st century and beyond. 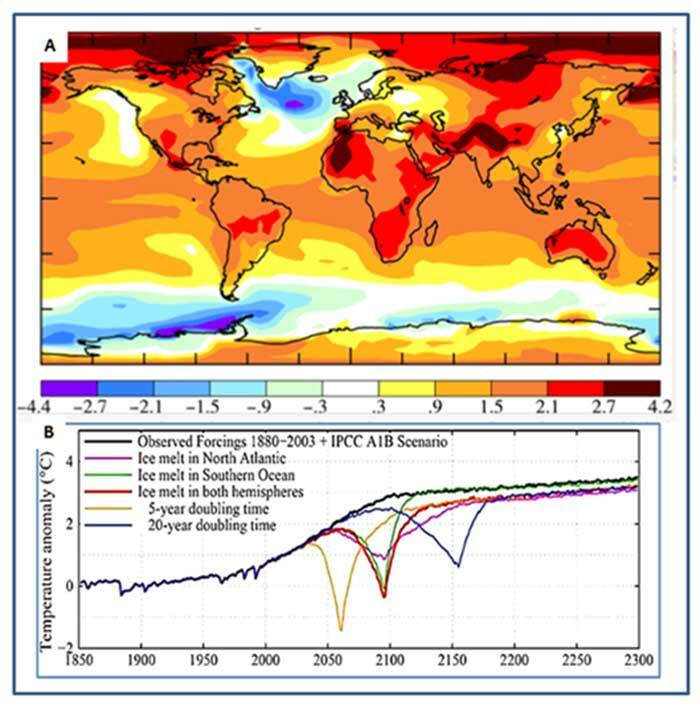 Early stages of a temporary freeze event are already manifest by a decline in the north Atlantic Ocean overturning circulation and the build-up of a large pool of cold ice melt water south and east of Greenland and along the fringes of Western Antarctica (Figure 2). Figure 2. [A] 2055-2100 surface-air temperature to +1.19oCelsius above 1880-1920 (AIB model modified forcing, ice melt to 1 meter) (Hansen et al. 2016); [B] Global surface-air temperature to the year 2300 in the North Atlantic and Southern Oceans, including freeze events resulting from the flow of cold water flowing from Greenland and Antarctic ice melt. IPCC models of future climate change contain a number of departures from the paleoclimate evidence, including the role of feedbacks from land and water, estimates of future ice melt rates, of sea level rise rates, of methane release rates, of the role of fires in enhancing atmospheric CO2, and the already observed onset of temporary freeze events. Ice mass loss would raise sea level by several meters in an exponential rather than linear response (Hansen et al. 2016) (https://www.atmos-chem-phys.net/16/3761/2016/acp-16-3761-2016.pdf). According to Rignot et al. (2011) in 2006 the Greenland and Antarctic ice sheets experienced a combined mass loss of 475 ± 158 billion tons per year. The development of large cold water pools south and east of Greenland (Rahmstorf et al. 2015) and at the fringe of West Antarctica (Figures 1A), signify early stages in the development of a North Atlantic freeze, consistent with the decline in the Atlantic Meridional Ocean Circulation (AMOC). As the Earth warms, the increase in temperature contrasts across the globe, and thereby an increase in storminess and extreme weather events, occurring at present, need to be taken into account when planning adaptation measures, including preparation of coastal defenses, construction of channel and pipelines from heavy precipitation zones to draught zones. In Australia this should include construction of water pipelines and channels from the flooded north to parched regions such as the Murray-Darling basin. https://livingnormally.blogspot.com/2019/01/world-dam-dynamics-makes-arctic-vortex.html and associated articles given there.